Choosing and managing life insurance can be overwhelming and intimidating. Catholic Financial Life, a non-profit financial services group, set out to change that by making insurance personal. Find out how Ascedia helped turn their website from an info hub to an engaged online community, all while improving operational efficiencies. Catholic Financial Life had a small internal team with little tech experience. The team juggling customer service calls and managing a surplus of product information to organize, all within a non-responsive website platform. CFL needed a site that was easy to manage and navigate. Above all, they wanted the site to have a personal touch; a place to build community and personal connections. Ascedia combined several of Kentico's features to accomplish Catholic Financial Life's website goals. To improve user experience, we used Kentico's account functionality to create a secure client portal using two-factor authentication. We also employed Kentico's site tree to improve navigation and set clear user paths. 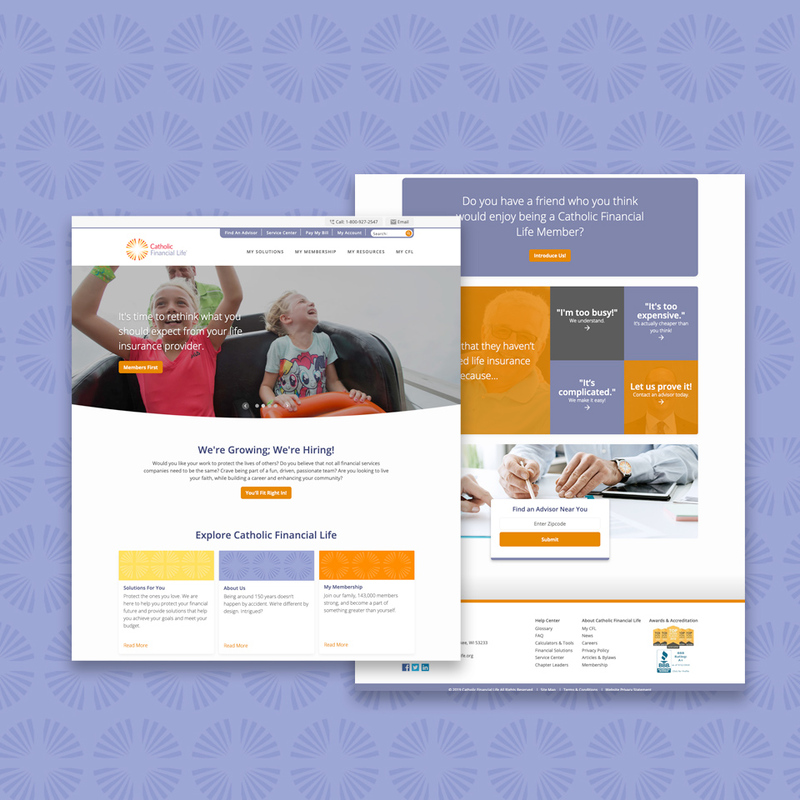 For website administrators, we used the media library and responsive image manipulation to ensure design and photography served up to the right scale. CFL also wanted to add a Prayer Network to engage with their community. We used Kentico's form functionality and API to integrate with the Pope's Worldwide Prayer Network. With the improved UX design, customers are finding what they need faster. CFL's staff saw a reduction in calls for generic inquiries like "what's my coverage status?" Financial reps also enjoy a responsive site; they can bring tablets to client appointments and create an online account on the spot, reducing paperwork and client pain points. One of the biggest wins for brand engagement is their new Prayer Network where users can post an intention and join nearly 143,000 CFL members in prayer. The intentions would also be escalated to the Pope's Worldwide Prayer Network. CFL can confidently say they make insurance personal. We chose Kentico for its scalability. Catholic Financial Life's new website is just a piece of an even bigger digital marketing vision. Kentico replaces CFL's original CMS and Hubspot and can flex to future efforts, like email marketing automation. Online account creation more than doubled within three months of launch. In the few months following launch, potential customers easily located a potential advisor for themselves through the website tool.